THIS IS IT! This is the con we’ve all been waiting for! Anime Expo is the biggest anime convention in North America, and Sentai Filmworks is pulling out all the stops to make this year our most memorable year yet with convention exclusive merchandise, signing events, free gifts, and more! Oh... also... we have some pretty big news and teasers to share with you guys at this year’s panel on Saturday July 2 from 11:30 AM to 12:30 PM in Petree Hall, so you MIGHT want to make sure you attend it. Hint hint. You will not be able to find these convention exclusives online. 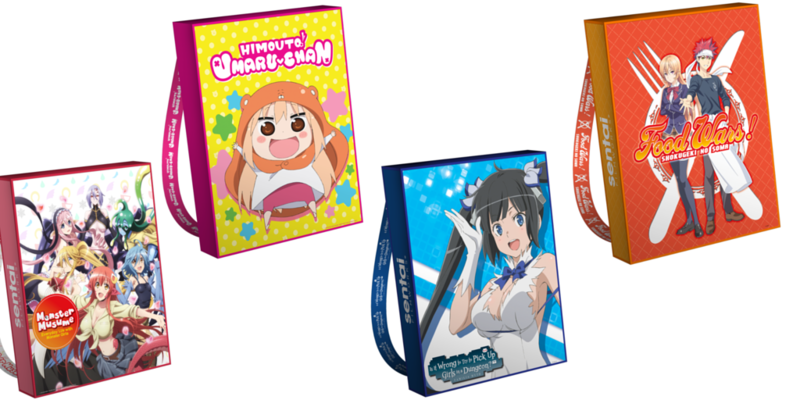 These can’t-miss items will be available ONLY at the Sentai Filmworks booth in limited quantities. Hestia Plush – Is It Wrong to Try to Pick Up Girls in a Dungeon? 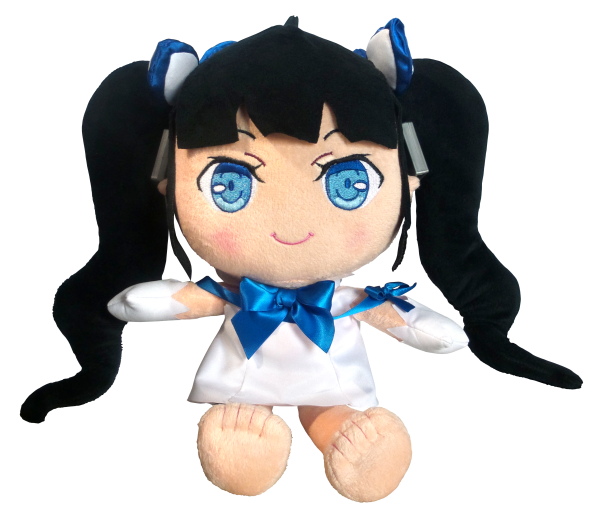 Appearing for the first time, we have our new Hestia plushie. Take home your favorite pint-sized, blue-ribbon clad goddess while we still have her at the booth. Isshiki Keychain – Food Wars! While you can also take home Soma and Erina, your Food Wars! collection wouldn’t really be complete without Isshiki in his KUMABEAR apron. This is the first time Sentai will be selling this keychain to the public, and you can only pick up Isshiki at conventions. Akame ga Kil! Wanted Posters – Set of 5! 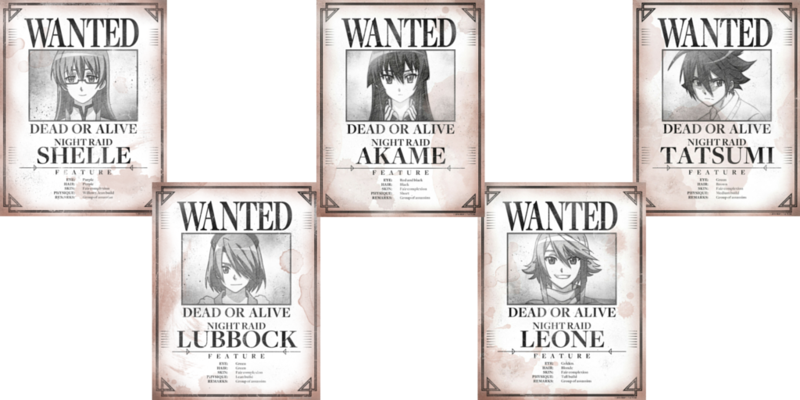 These prints were designed in-house at Sentai Filmworks, inspired by the real WANTED posters that appeared in the anime. The set of five 8.5” x 11” prints includes posters for: Akame, Tatsumi, Leone, Lubbock, and Shelle. Get a free Monster Musume: Everyday Life with Monster Girls convention bag signed by the creator Okayado-san with any purchase. This offer will only be available to the first fifty customers starting on Saturday at 1:00 PM. Also included: Parasyte -the maxim- Collection 1 and Collection 2 premium box set and a Migi T-Shirt. 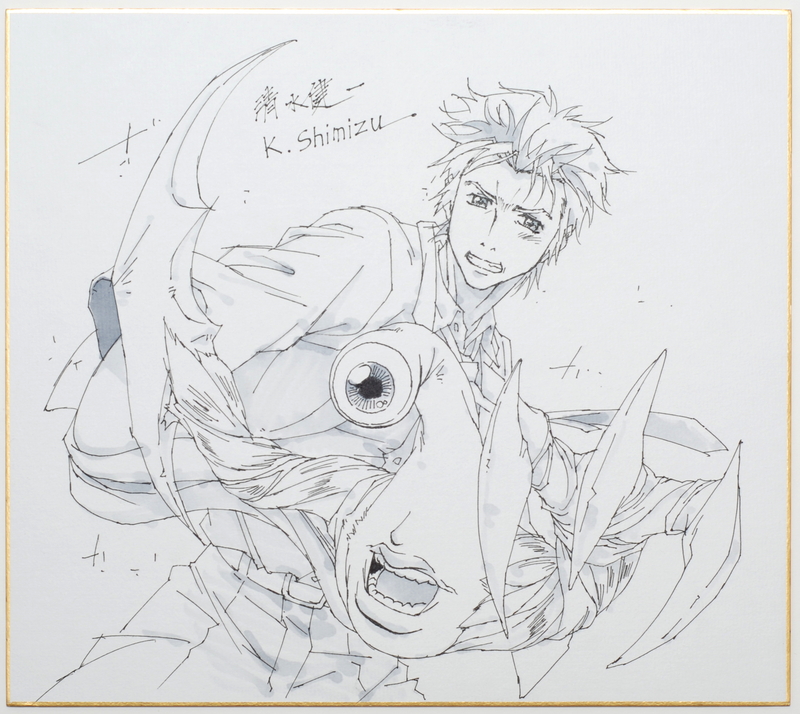 This one-of-a-kind Shikishi board was created by one of the animators. When you purchase anything related to the Akame ga Kill! 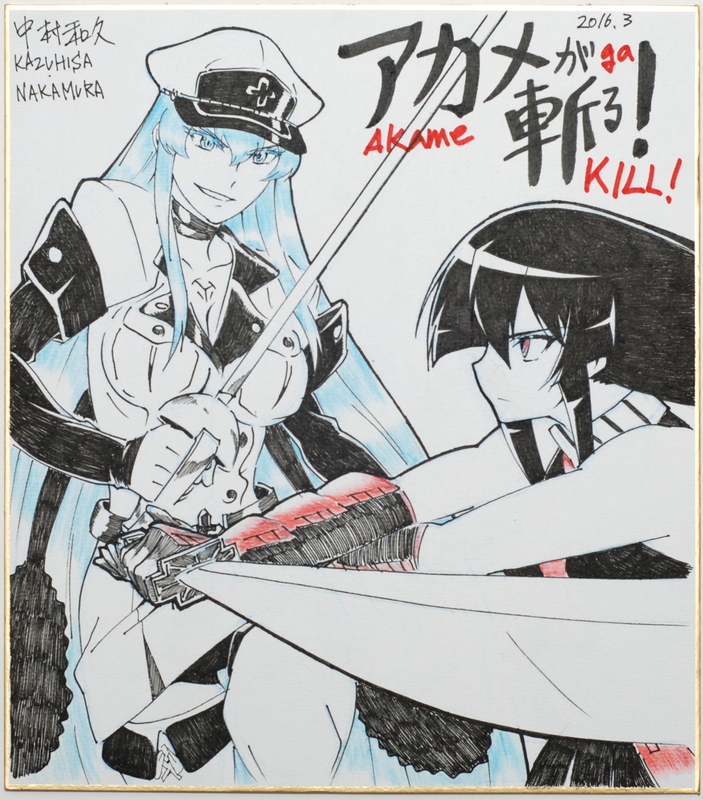 franchise at the Sentai Filmworks booth, you will be entered for a chance to win this Akame vs. Esdeath Shikishi board. The raffle will take place at the booth on Monday, July 4th at 11:00 AM, and you MUST be present at the Sentai Filmworks booth to claim your prize. We’re proud to host the producer behind the award-winning anime about making anime, Kenji Horikawa! Horikawa will be signing SHIROBAKO posters at the Sentai Filmworks booth on Friday, July 1 from 1:00 PM to 2:30 PM. Secure your place in line by lining up at 12:30 PM sharp! Nami Sato, the author of the manga Haven’t You Heard? I’m Sakamoto will have a signing event at the Sentai Filmworks booth. Swing by on Sunday, July 3rd from 10:30 AM to 11:30 AM to have a free Haven’t You Heard? I’m Sakamoto poster signed by the creator herself! Please note that no photography or video will be allowed of the signing, and that the line will be limited, so start lining up at 10:00 AM sharp to secure your place! Wow. That’s quite a lot to keep track of, but don’t worry: we’ve got you covered. 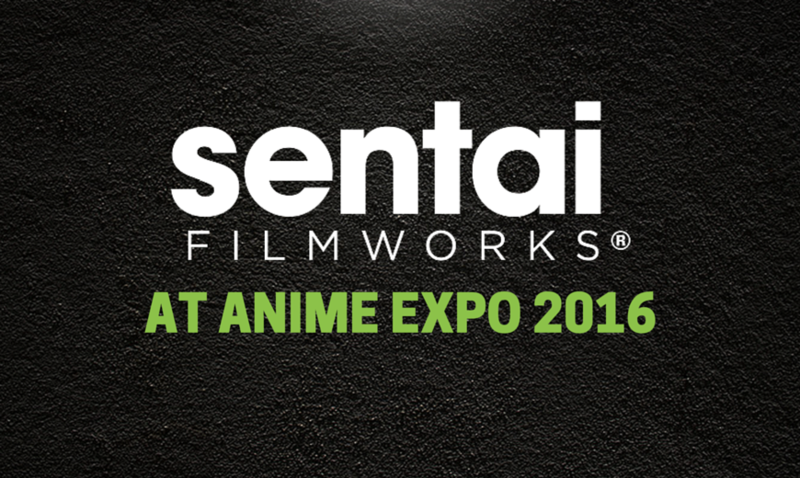 Download our Sentai Filmworks at Anime Expo PDF so you won’t miss a second of any of our exciting events.